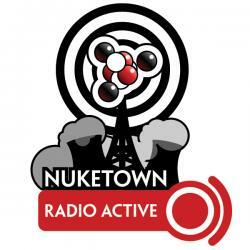 On this edition of Radio Active I’ve got some thoughts on GenCon 2007 and Podcamp Philly, catch folks up on what’s happening at Nuketown, try and figure out what it takes for me to buy a Mac, discover the BioShock soundtrack, stop by Vegas After Midnight. I also delve into the D&D Insider, contemplate the Master Plan Podcast and review the pile of gaming goodness I picked up at GenCon. Day-by-day accounts of my time at GenCon are available online. I talk about the games I played, the people I met, the experiences — in game and out — that I had wandering the world’s biggest gaming convention. Overall, it was a fantastic show — it was fantastic meeting all the podcasters I’ve been listening to for the last two years, and to finally have faces to go with all the voices. Only spent a day because a) wasn’t sure how good it would be and b) traveling a lot this fall and wanted to spend time with the family. Definitely worthwhile. Some seminars better than others, and not nearly enough workshops, but I learned a lot, it was great meeting fellow podcasters, talking with new people, and just geeking out for a day. I’m planning on getting some t-shirts made for GenCon 2008 (assuming I’m going). If I do so, I’ll probably offer some to listeners as well, either for sale as give aways. If you’re interested let me know: nuketown@gmail.com. My tale of Mac-buying woe. Can Preshoolers Get Drunk on Hand Sanitizer? Why won’t Steve Jobs sell me a Mac? I’ve been losing myself in BioShock for the last three weeks or so, fighting my way through a pseudo-Randian dystopia that’s as engaging as it is beautiful. Part of what makes the game so exception is its soundtrack, which is by turns cinematic, classical and terrifying. Now you can enjoy composer’s work outside of the game by downloading the soundtrack for free from the BioShock web site. “A pulp-punk dystopian role-playing game, coming soon from Harping Monkey Studios”. Based on the Spirit of the Century rules. By Mick Bradley and David Moore. Featuring a world gone bad after some sort of apocalypse has devastated America. I’ve been fascinated by Vegas as a post-apocalyptic destination since reading The Stand, and I’ve enjoyed Mick’s rambling thoughts on the setting and the short fiction that’s been produced to date, so I can’t wait to see it in action. A podcast about game design, featuring interviews with professional and amateur game designers. By freelance writer Ryan Macklin. I listened to episode #12, which interviewed the guys behind Bully Pulpit Games. Other episodes have talked about playtesting, designers block, mechanics, as well as interviews with Evil hat Productions, Ashcan Front and Ken Hite. Battlestar Galactica RPG (no web site yet): Fight or flee, you’ll have to deal with the toasters eventually. Savage Worlds Explorers Edition (no web page for this book): New core book for the fast-and-furious system. Pirates of the Spanish Main RPG: Savage Worlds-powered piratical adventures. Hellboy RPG and Source Book: A good-natured demon fights the forces of darkness. Burning Wheel: A fantasy RPG inspired by the likes of the Wizard of Earthsea. May also want to pick up Burning Empires, which is a science fiction implementation of the same ruleset. New Chessex battlemap and Shadow dice, which are dark black/blue dice with swirls of green, purple, and blue. They’re numbered in gold, making them highly readable.